The following is an excerpt from an email sent to one of our Macro Ops Hub members. It’s a cursory look at how we apply the Macro Ops’ Trade Identification Formula (MOTIF) to markets. The MOTIF series was originally introduced to our Operators through the Vault — a section of the Hub that contains a growing number of educational PDF’s to help advance our member’s trading knowledge and skill set. If you’re interested in learning more about the Hub and everything it offers, including the Vault and MOTIF series, just click here. Enjoy the MOTIF example below! The MOTIF structure simply serves as a starting framework to build other mental models and practices off of. It helps ensure that you’re trading with the larger trends and macro forces currently at work. This is extremely important. As traders, we want as many tailwinds behind our trades as possible. Let’s go through a recent trade example to see how we identified a trade setup using the four steps below. We’ll start with the broader market and then work down to the individual equity level in order to establish the direction of cyclical and intermediate trends. Below is a chart of the S&P 500’s 200 and 50 day moving averages. It shows that both are in a clear uptrend, meaning that on a cyclical and intermediate basis, the trend in US equities is up. 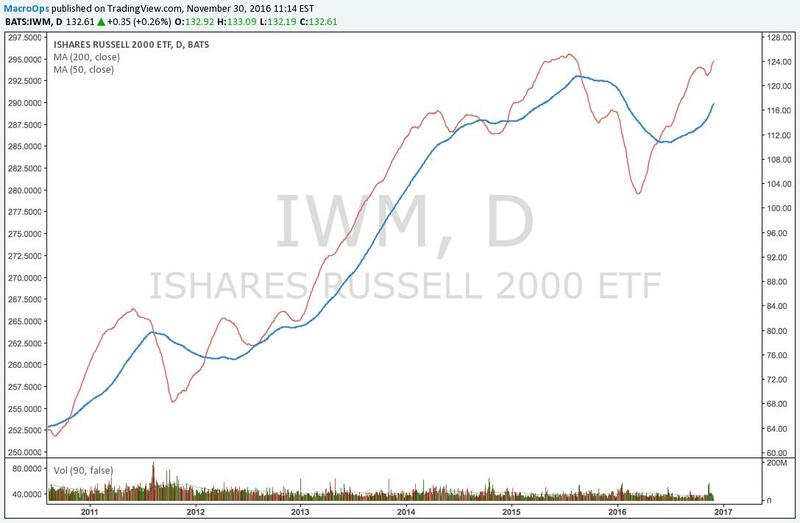 The chart below of small cap moving averages show the same thing. The trend is up on a cyclical and intermediate basis. The next step is to look at gauges of liquidity to measure the durability and risks to these trends. 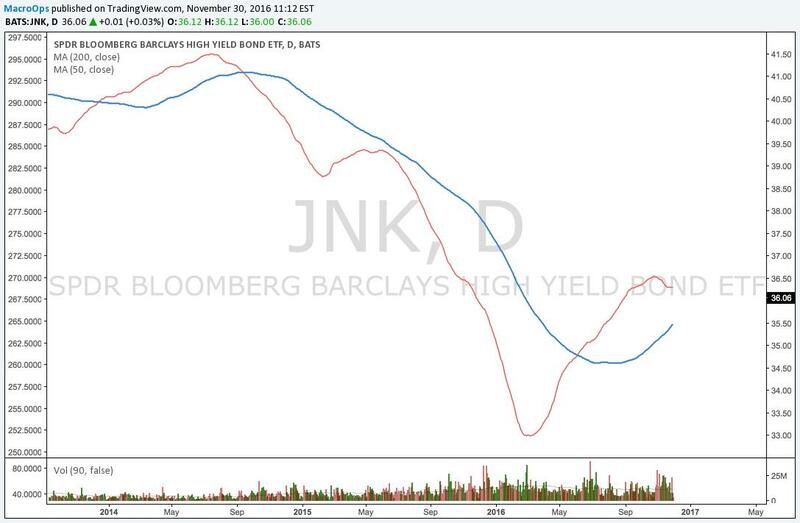 Here’s a chart of JNK — the high-yield ETF. The 200 DMA is pointing up and the 50 DMA is in a broader uptrend even though it’s temporarily stalled. 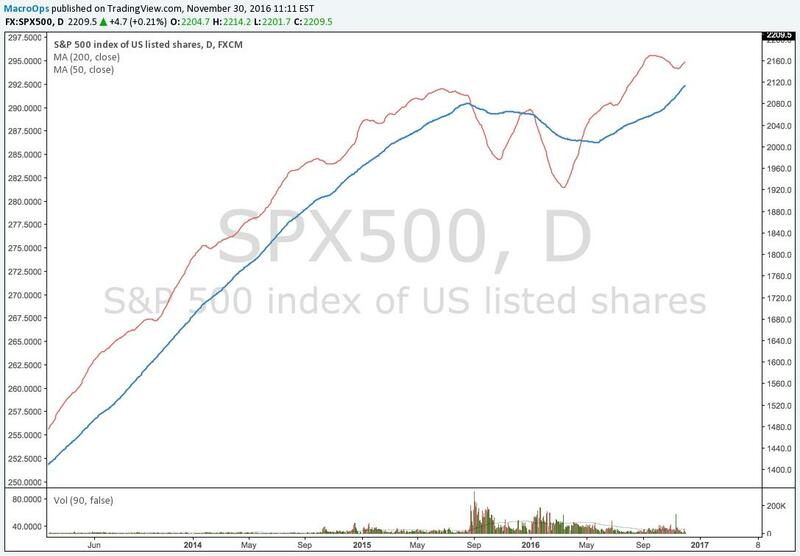 This is something to keep an eye on, but overall liquidity is positive for equities. We can also take a look at the Hub’s proprietary liquidity gauge which aggregates a host of credit spreads. The line on our liquidity model is pointing up — an equity positive. The cyclical trend is up, as well as the intermediate trend. 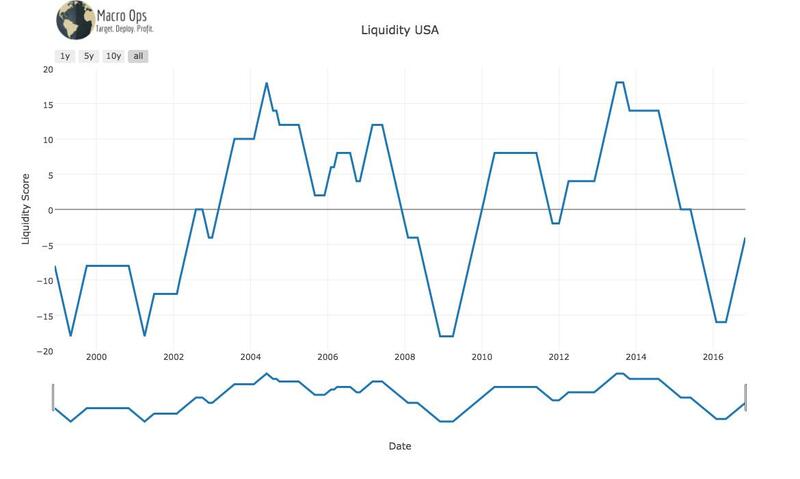 Liquidity has rebounded after 18 months of tightening and is growing stronger. There’s some intermediate term neutral direction in liquidity, but this looks like it’ll resolve to the upside. This means that the trend in equities has some potential to last with strong bullish moves. Knowing this, we want to get long stocks. This is where jump into the P&T (price and theme) filters we discuss in the second MOTIF piece. First we go through some themes. Lately, we’ve become interested in asset heavy companies due to the growing gap between financial assets and real assets. We’re also interested in beaten down value plays that have the potential to turn into new growth names. A lot of the older growth names that have led the last few years are extended and a bit tired looking. Next we run some screens based on this criteria (we’ll share a number of the quant screens we run in an upcoming piece) and sift through their charts. This leads to a handful of heavy construction companies. The theme here is obvious from the Trump win. We’re moving into a period of greater fiscal spending and infrastructure development. 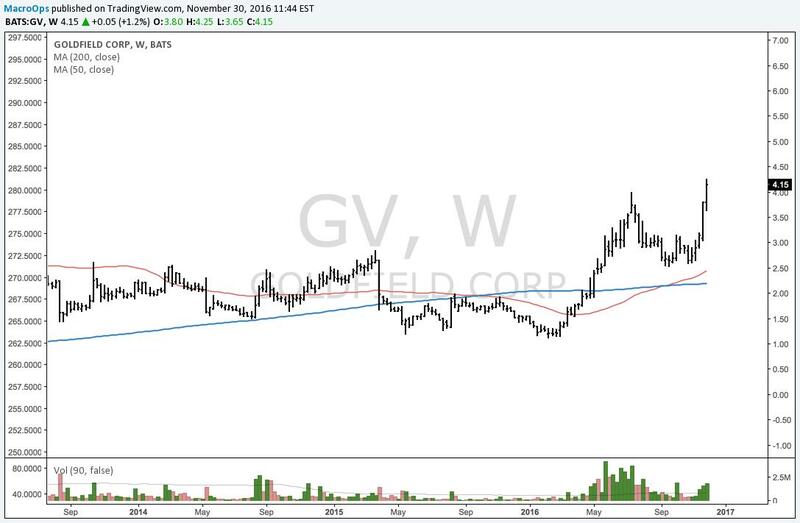 One of the value screens brings up Goldfield Corp (GV) and the price action looks great. The weekly chart shows how price rose at the beginning of the year on a large volume after many years of basing (consensus). We ended up taking a position in the Strategic Portfolio around $3 and it’s now trading at $4.15; a near 40% move in just a few weeks. Price action provided a great “go or no-go” entry at $3. If the stock fell below $2.50, then the thesis was wrong, or at the very least the timing was off. This allowed entry with a decent position size that we could pyramid on as price moved in our favor, which is exactly what we’ve done. The company has strong top and bottom line growth, a small stock float, and a clean balance sheet. It also specializes in construction on the electricity grid. Our electricity grid in the US is extremely outdated and very vulnerable to attack from foreign nations. Revamping the electricity grid is one of Newt Gingrich’s biggest talking points and he’s a close friend of Trump’s. A $6+ stock is possible in a few months. We can do this same type of analysis for equities in any market around the world. Now if we’re looking at currencies or commodities we’ll use a similar framework but some of the inputs (like interest rate differentials and weather patterns) will be different. We’ll be writing future articles on all of this. The MOTIF framework series is currently available to all Macro Ops Hub members. If you’re interested in joining and getting a deeper look at how we find our trades, click here. And remember, the Hub comes with a 60-day money-back guarantee. This means you can join, try it for two months, and if you don’t like it, get your money back right away. It’s a zero-risk deal. You never get that in the markets… be sure to check it out! Lessons From A Trading Great: Stanley Druckenmiller Intuition In Trading And Investing: Can You Trust It?